Local and Long-Distance Calling with the most popular features PLUS High Speed Internet! More speed and price options available. Local and Long-Distance Calling with the most popular features with PLUS TV! Ask about our basic and premier rates. 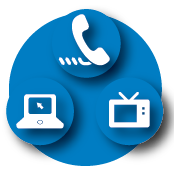 Local and Long-Distance Calling with the most popular features with PLUS TV and Internet! Ask about more speed and TV package options. 1. Reboot your router by simply unplugging the power cord from your router, waiting 10 seconds and plugging it back up. This should prompt the router to update to the latest firmware. 2. Run your antivirus software on all devices. Be sure that your antivirus is up to date. 3. Log in to your router with the router’s manufacturer instructions located on the device (typically on the label on the bottom) and change the default username and password used to log into the device. Write your new username and password down for future use. 4. Turn off remote management if your router has that option available. If you lease a Calix GigaCenter wireless router from Chesnee Communications, you do not need to take action on steps 3 and 4. These steps have been handled as part of the advanced capabilities of this particular router. If you subscribe to Complete Coverage or another Chesnee Internet Maintenance Plan and experience any problems with completing these steps, please call our Support Services team for assistance at 864-461-2215. As always, Chesnee Communications recommends having an up-to-date antivirus, using secure passwords for all your online devices and changing default usernames and passwords for any internet-enabled devices.